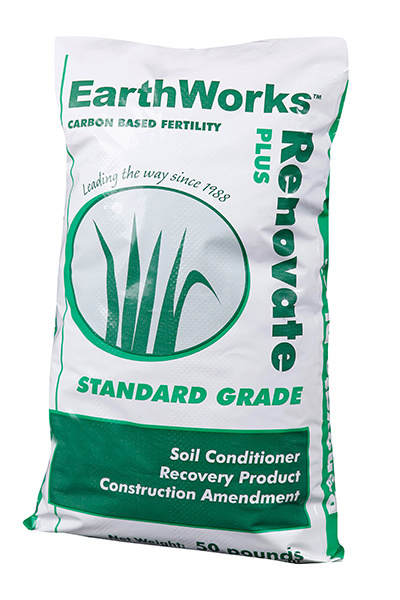 Renovate/Plus is a 50/50 combination of EarthWorks Renovate and Eco-Lite and is a powerful amendment that will open tight soils, speed turf recovery, and stimulate soil biology without a big nitrogen push. This combination allows for oxygen movement through the soil and promotes an active microbial generated nitrogen cycle. It is ideal for numerous projects on the golf course or sports field and can “save” those hard to grow areas. Renovate/Plus is the combination of all the raw materials found in the EarthWorks “Construction Program” which has been a huge success since the early 1990’s, and has been the amendment program of choice for hundreds of golf courses as well as professional sports stadiums and other athletic fields. Renovate/Plus encourages quick recovery of “dead spots,” is the ideal product to put under any sod job, and can replace multiple aerification products to simplify those projects and significantly increase their success rate. Renovate/Plus encourages quick recovery of “dead spots,” is the ideal product to put under any sod job, and can replace multiple aerification products to simplify those projects and significantly increase their success rate. Renovate is a blend of carbon and mineral amendments including kelp meal, compost and humic acids which make up a sustainable microbial food source of short, medium and long chained carbons. The diversity of ingredients allows for a quick jump-start of soil activity, but one that will also be sustainable. 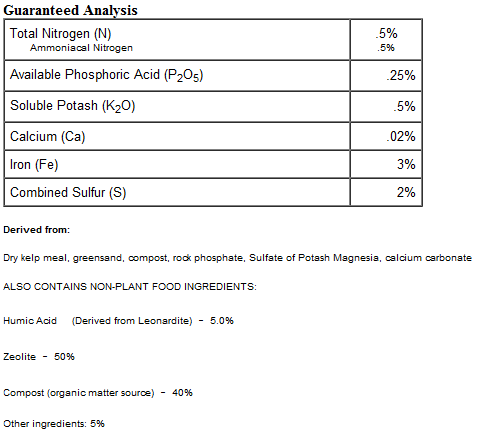 The mineral fraction of Renovate includes greensand, sul-po-mag, hard and soft rock phosphate, and calcium. This combination prevents de-mineralization of the soil and allows for roots to take up nutrients as needed, and is a great way to provide a biological foundation to any soil by promoting soil flocculation and turf recovery. Eco-Lite is the premier zeolite rock mineral mined from an exceptionally clean zeolite mine and provides an array of physical benefits including the highest CEC of all physical amendments. Zeolites are very hard rock minerals that possess a crystalline structure and have the capability to absorb water when the surrounding soil is wet, creating better air movement in the soil and allowing for the controlled release of this water when moisture levels in the soil fall. 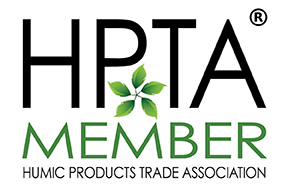 Perhaps the greatest difference between Eco-Lite and other physical amendments is its affinity to hold both ammonium nitrogen and potassium, allowing for both nutrients to be more available to the plant over a longer period of time.